Even with that, and even after making barrel outfit, I still had a few problem porting clutters as an outfit. They were always static and floating above my character. I finally found out that it was because I copied the BSLightingShaderProperty from the original clutter item and pasted it over the new outfit one. When I found that it was only this causing me problem, I remembered of my first armor port I did in Fallout. It was doing the same thing. Because one of the shader flag was wrong. I remember spending a night trying to find why before I could find a guide and finally fix it. So this must be similar in Skyrim. I'm not very technical when it comes to these kind of stuff so I will probably never find out exactly which shader flag cause this. Maybe someday, if Nifscript ever get updated, we'll be able to set those flags directly when exporting. For now, I know that if I I'm making an outfit, to copy from another outfit, and if I make skin, to copy from another body. I tried to make Archer Skeleton equip them. And it worked. But it looked silly, so I decided not to. Although, you still can select some of the skeletons and use equipitem console command, and they should wear it since I let them enabled in race selection. Since it doesn't use anything else than Vanilla model and textures, I decided to upload it on nexus again. I don't know why I never posted my oblivion one over there. Maybe I will. Again, it was posted on Dragonporn which is very touching because they usually only post about the best mods and I don't think mine are close to being best mods. Again, feel free to post screenshots. This is just too cute, may I ask what hair you are using though? First, you have really amazing creations on this blog, many thanks for making them public! I´ve been looking through your posts and got a bit shocked when I saw the picture of this post. But how did you manage that your female character actually properly holds the bow and arrow? There's an Optional Bow Draw files that fix it. Thank you for your resarch. I tryed this mod but it only changed the animations, not the actual bow and arrow position... And there isn´t a preview of the bow draw for females. Only males. 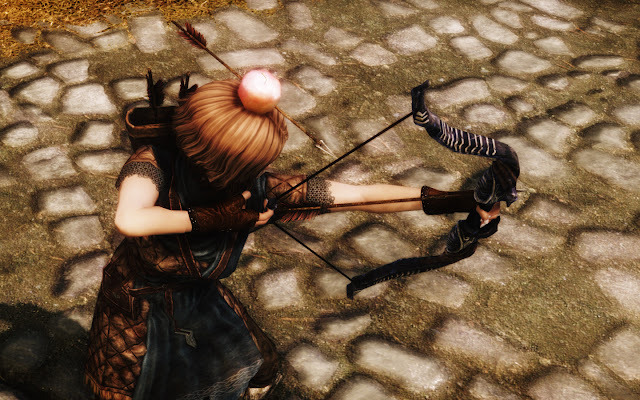 Bow for females still is too small with this mod. I´ve even uninstalled all my my mods to see if it would conflict with something. There the problem is discussed. Seems the female skeleton.nif weapon scaling is rezided, so that it makes bows smaller. With the file provided on this topic, the issue is fixed for my normal, vanilla Nord character. That doesn´t help me very much though, because I like to use Enhanced Character Edit and a skeleton compatible with Mystic Tails mod. ( Catgirl, meow :3 ). I will have to look into modifying my skeleton it seems. ECE does provide a slider to change the weapon resizing, but it resizes the arrow aswell... arrrrgh.. so the feather clips into the hand. That is strange... ECE negates my skeleton edits. Works fine without ECE but then I don´t have my pretty girl lol... It´s either pretty bow animation or pretty girl unless I find a workaround. So dumb. Another thing I found: Proper length arrows mod. This does lengthen the arrows so it looks even better in 3rd person. The downside is, that it also lengthens them in 1st person view, which looks dumb again. I think you would need to modify the skeleton in YgNord folder if you're using that race with ECE since they use their own. I never really played with skeleton modification so I don't know if that would work. I know what you mean about modding. I finished the game in the first 2 weeks it came out so now I mostly only make and test mods. I only actually play a few hours a month. I still have to finish Dragonborn too. Yep, I did modify the YgNord skeleton. When starting up the game it briefly showed the changes (so it works) but reverts back to normal immediate after. To test, I increased the quiver size by 5 hehe, so when I start the game my character is barely visible under the huge quiver. But half a second later, everything is back to normal... ECE somehow overwrites skeleton edits. I also changed the ECE.esp to use a skeleton from a different directory. Same result. Change the SHIELD node from 1.0000 to 1.1834.
and add a # symbol infront of it. Some time ago I checked on Halofarm´s blog and saw his nice screenshots. I noticed his catgirl has actual fangs at her teeth. I asked if Halofarm could release the corresponding file. And he did! I think you could use this for your Elly follower.